Tuesday, June 5 from 6 to 8:30 p.m.
One of the most entertaining events of the Ridgway RiverFest is the Junk of the Unc homemade watercraft competition. Fun for spectators, the Junk of the Unc is a fantastic experience for builders and racers. UWP encourages creative, adventurous spirits – young and old – to build your own unique floating craft to put on this year’s festival on Saturday, June 30. You could win one of four fantastic trophies, if you are the Fastest, Most Artistic, Best Reused Materials, or Best of Youth. If you need inspiration to build your craft, come to the Junk of the Unc Build-A-Boat Workshop on Tuesday, June 5 from 6 to 8:30 p.m., when past competition winners will share their tips on producing the most float-worthy, eye-catching crafts. 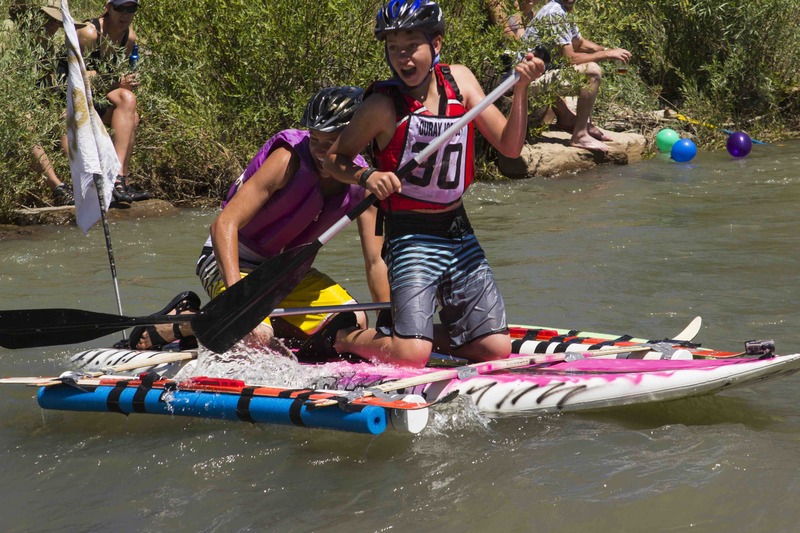 This fun workshop is especially designed for creative adventurers planning to participate in the “Junk of the Unc” homemade watercraft race on the Uncompahgre River during the Ridgway RiverFest. Non-racers interested in learning the ins and outs of creating a floatable vehicle are also welcome. This class is suitable for all construction skill levels, beginner to advanced. No experience is required, but builders are advised to have moderate to advanced river recreation skills to use their homemade watercrafts on the river. The whole point of building your own river boat is to show how repurposed and recycled materials can take on new life through some imagination and a little sweat equity. Plus, you can entertain family, friends and festival goers with your unique style and theme. Past Junk racers have featured pirate flags, baby car seats and structures ranging from paddle board-type foundations to rafts made out of every floatable material imaginable. For the workshop, some materials and supplies will be provided by instructors, but students may also bring their own. A list of suggested materials to bring will be sent to students before the workshop. This is a 2.5-hour workshop on Tue., June 5, from 6 to 8:30 p.m. at a studio in Ridgway (address to be shared after registration. The maximum student capacity is 8 people, and the workshop will be cancelled if less than 4 people sign up. Registration is $20 for adults and $10 for youth (11 to 19 years old), and includes a free race entry into the Junk of the Unc (a $20-$35 value). If you have questions, please contact Tanya at ridgwayriverfest@gmail.com. I have some materials to bring to build a craft for my use. I do not have materials to build my craft, so will help build someone else's craft. For more information on the Junk of the Unc, go to Ridgway RiverFest Junk of the Unc page.